The vast majority of people in college either live in a dorm or in an apartment. Few people actually come from the town or city that their university or college resides in, so we need alternate lodgings while we’re away. 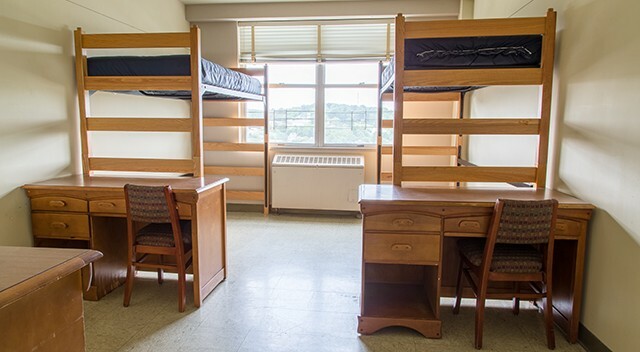 Most college students tend to live in the dorms because most universities require that you live in a dorm for at least one year of your college career. But plenty of people also live in apartments near the college campus, and many people often wonder which is better. One of the upsides to living in a dorm is there are no bills to pay. Once you’ve paid your tuition, you’re set; you can use as much heat, water, and electricity as you want without worry. The same cannot be said for those who live in an apartment. Many who do live in an apartment have to work within a budget, and utility bills can add up very quickly. This leads into the issue of roommates as well. Practically everyone in a dorm has at least one roommate, and some even have three or four. The same can be said of most people who live in an apartment. While there is the option to live by yourself, most people cannot afford to do so and have to get at least one other person to live with them. However, the main difference between having a roommate in a dorm and a roommate in an apartment is that in an apartment, utility bills can be very high/expensive with multiple people. A single person can increase the bill significantly for the other roommate(s). The flip side, however, is that in an apartment there is almost always more space and everyone has their own room. One of the worst parts about living in a dorm is the lack of space and the fact that you have to share a small room with another person. While you still have to share space inside of an apartment, you have your own room at least. This extra space can help ease a lot of the tension that one usually finds inside of a dorm room. There is also the benefit of having your own personal kitchen and not being subjected to a limited meal plan. With your own kitchen, you can make whatever meals you want whenever you want them and store whatever food you want without any real hassle or fear of it going bad. At the end of the day, it comes down to your own personal preference as to where you want to live and what you want to sacrifice. I tend to listen to my music throughout the day. While I get up and get ready, through doing my work, sometimes while walking to class, and even while getting ready for bed at the end of the day. It is something I have found to help me stay on time and motivated throughout the day. I also tend to leave my door open when I’m in the room, and I’ve enjoyed seeing the variety of musical tastes from my neighbors along my floor. It’s entertaining to the shift in the genre of music throughout the day, and sometimes it’s surprising or can help me make a connection with the listener. One thing that does bother me though, is that sometimes people feel it necessary to blast their playlist at 11 pm or later, and in some cases extremely early in the morning. I understand that you may be a night owl, or an extremely early riser, but could you please have your volume reflect the time of day? It’s always a bit shocking to wake up some mornings to Lil Wayne coming from down the hallway at full blast at six in the morning. Or to be snuggled in bed and on the brink of sleep at 11:45, only to be jolted awake by Taylor Swift coming from the other end. Or maybe above or below. Some headphones, or even just taking it down a few notches would be great. We don’t all want to feel like our hall is at a concert with the music and bass blaring. By all means, please do enjoy your music. But maybe be a little more aware of others around you during courtesy and quiet hours? Not everyone can start their day with some wall shaking rock, but rather quietly ease into it; or end their day with jolting dance, but to wind down with the night. Something that I notice is missing from the population of college students I’ve been watching for the past three and a half years is that they don’t seem interested in acting smart. By acting, I don’t mean pretending to be intelligent by using big words that you would find on the SAT and nowhere else. What I mean is there are many really smart people who just aren’t interested in being seen that way. I feel that I have a lot of experience in dealing with intelligent people who just don’t try hard enough. I was friends with a handful of “gifted” students in high school. Most of them seemed to think that by being in the gifted program they should be revered for their brilliance, even though most of them hadn’t accomplished anything of much importance. After living in the honors dorm, or residence hall if you’re all politically correct, for over three years, I’ve noticed the trend in people who are considered intelligent seems to have reversed. A lot of people aren’t interested in touching the Honors Academy with a 10-foot pole. Those who are interested tend to stick around only long enough to live in the honors dorm and have early class registration. Let’s face it, the honors dorm is still basically prison-like and early registration is only a benefit once a semester. Being in the honors dorm gets old really fast. On the other hand, the program forces you to work a little closer with your teachers than you might have otherwise. That’s where the appeal is for those who stay. Sadly very few of us stick with the honors track to the end. Every year since I’ve been at Radford University, I’ve watched my fellow honors students drop like flies. I think that’s what makes it such an accomplishment in the end. Not dropping out because it’s “a waste of time” or “too hard” means you have work ethic. Being labeled an honors student or “gifted” isn’t what makes people smart; recognizing your strengths and weaknesses and putting them to good use is what makes us smart. There are plenty of “gifted” individuals who recognize their strengths and decide that they are so smart that getting to class every day on time is beneath them. That’s what I call a waste of an existence. I dislike seeing people get horrible grades because they think the material in class is too easy. If it’s so easy then you should be able to get it done, right? Another thing I’d like to warn my fellow students about is coming off as superior to others. Brilliance doesn’t make a difference if nobody can stand to be around you for more than a few seconds without considering the feasibility of jumping out of the nearest window. It’s bad enough when intelligent people are too smug, but it’s 10 times worse when people act like they have multiple degrees in something they’ve never even cracked a book open to learn about. If you’re insecure enough to have to one-up everyone around you who is a little more educated, I think you have bigger problems than just your intelligence.